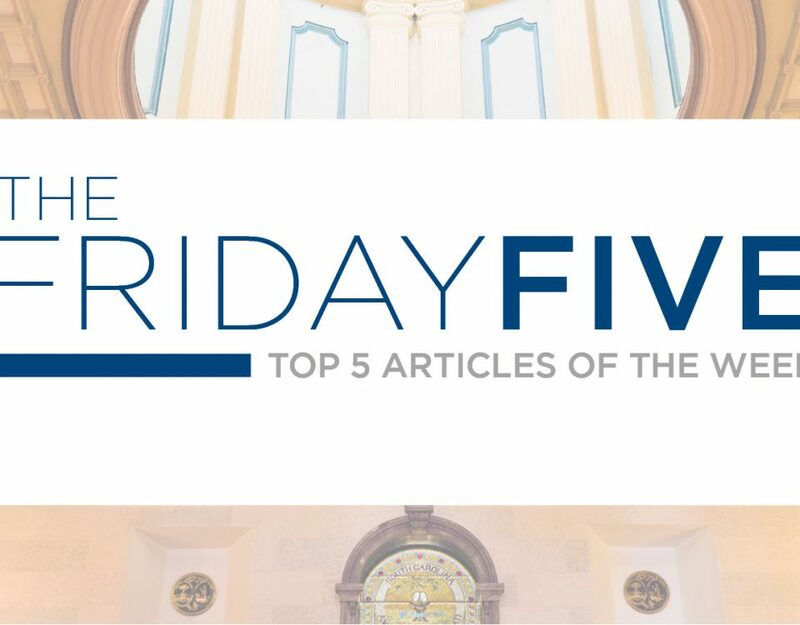 It’s time for this week’s edition of the Friday Five: Articles you may have missed this week, curated just so you sound smarter at your church coffee hour. Speaker Lucas proposes largest education overhaul in decades. This will probably qualify as the biggest story for the next several weeks. We’re also fairly interested in the fact that the bill clocks in at 300 words shorter than Ernest Hemmingway’s “Old Man and the Sea.” We’re excited about this legislation and are working to plow through it this weekend, but it hits many of the major reform items the business community has talked about for many years. Attorney General Alan Wilson holds press conference denouncing medical marijuana legalization. A press conference showcasing a coalition of intense opposition to legalizing medical marijuana took place at the center of the Statehouse on Wednesday, January 23. The effort, led by South Carolina Attorney General, Alan Wilson, emphasized concurring opinions amongst other powerful entities including State Law Enforcement Division (SLED) Chief, Mark Keel, the President of the South Carolina Medical Association, a handful of lawmakers, and others. The fifteen legislators currently sponsoring the newly proposed legislation to legalize medical marijuana aim to include South Carolina to the list of the thirty three states that have already legalized this drug for medicinal purposes. Why Homeowners Should Look at Entering Upstate Markets Now. As interest rates are projected to increase this fall, chief economist at the National Association of Homebuilders, Robert Dietz, reasoned that Upstate residents interested in entering the housing market may find it cheaper to partake in sooner rather than later. “If you’re thinking about buying a home, I would do a serious search,” Dietz said Tuesday to a 200-plus audience representing the housing, real estate, and construction industries. Special SC Senate District 6 Primary Results. Republican nominee, Representative Dwight Loftis, and Democratic nominee, Tina Belge will represent their party for the upcoming general election on March 26th. The winner will replace now Congressman William Timmons. Bite Squad to extend services in Easley/Powdersville. Since the restaurant delivery service launched in Greenville, pressure to expand into surrounding communities has been exerted on Bite Squad’s CEO. Customers that order between Janurary 25th and February 28th will be offered a free one-year membership. Bonus: Is there a positive correlation between a candidate’s logo and their ability to win an election? You decide for yourself. The potent “O” logo produced by Barack Obama’s presidential campaign unified numerous contrasting elements, creating a timeless and visually pleasing political brand which will go down in history as one of the best. Obama clinched the democratic nominee and went on to win the White House in 2008. The logos from Marco Rubio’s campaign and Hillary Clinton’s campaign were not well designed, and both campaigns were unsuccessful in the long run.